I know it is summer time and most of you are thinking flip flops not slippers but I live in Wisconsin and you never know when that white stuff will start falling from the sky. 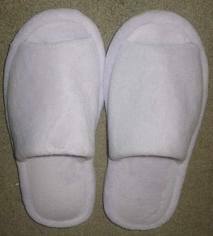 Natures Sleep provided me with a free pair of slippers to review and they will provide a winner with an additional pair. All opinions are 100% mine. The bottom soles did provide enough grip to not worry about slipping. I have even swept and mopped in my slippers and never feel at danger of slipping. I will also admit that I wore these slippers to the movie theater when I took my daughter and her friend to see "Brave" as we were all in our pajama's. :) Some of you might gasp thinking the bottoms would get nasty from spilled soda and popcorn but the bottoms are rubber so clean up is quick and easy. WHO WANTS TO WIN A PAIR?? I wear a 9 and rather have the closed toe. Size 7, or 6.5 if there are half sizes. I'd prefer the closed toe option. I'd go with a closed toe (I always go to get a drink in the dark and stub my toe) and I wear a size 9 in womens. I wear a size 7, and I like the open toe. I like the Chocolate Whole Food Energy Bars. Size 8 closed toe for me. Chocolate Green Superfood is my favorite from the amazing grass site! I wear a 8.5 and I would like the closed toe! I wear a size 7, closed toe! Size 8 closed toe, please! I honestly haven't decided which I like more the idea of an open or closed toe. I am usually about a size 6-7. I like the open-toe and size 6! Size 10 and opened toe.